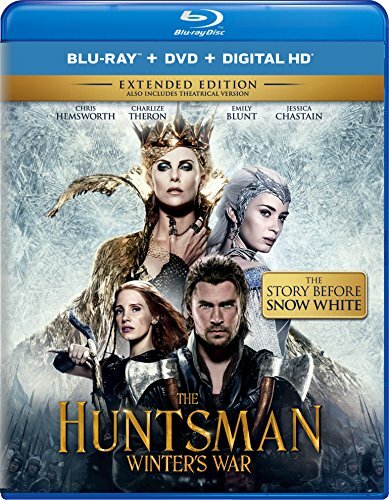 Contest: Win 'The Huntsman: Winter's War' On Blu-Ray! We're happy to offer our readers the chance to win a The Huntsman: Winter's War on Extended Edition Blu-Ray DVD! The sequel to Snow White and the Huntsman stars Chris Hemsworth, Emily Blunt, Jessica Chastain, and Charlize Theron. SYNOPSIS: If it's the Snow White tale you're looking for, discover the story that came before… Chris Hemsworth and Oscar winner Charlize Theron return to their roles in the epic action-­adventure The Huntsman: Winter’s War, joined by Emily Blunt and Jessica Chastain. Theron stars as evil Queen Ravenna, who betrays her good sister Freya (Blunt) with an unforgiveable act, freezing Freya's heart to love and unleashing in her an icy power she never knew she possessed. As war escalates between the two queens, Eric the Huntsman (Hemsworth), and his fellow warrior, Sara (Chastain), must help Freya vanquish her sister… or Ravenna's wickedness will rule for eternity. To enter, simply complete the Rafflecopter contest form below. Winners will be selected on Friday, August 26th and contacted by email. Thanks for entering and good luck! The Huntsman: Winter's War is available now on Blu-Ray, DVD, and digital.